I’m always looking for healthy snack ideas and I think you are going to enjoy this new creation as much I do. It will be a great addition to your healthy snack toolbox. Sneak it into the movie theatre (you didn’t get that from me :-)), or take it for your pre-workout snack. It won’t matter when or where you eat these tasty goodies, you will love them. In a mixing bowl, whisk together the egg white, lime zest, lime juice, and smoked paprika. Add cashews and mix until all the cashews are coated well. 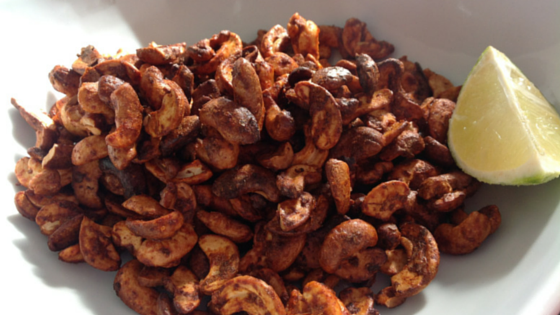 Spread cashews onto baking sheet and bake in oven for 10 to 15 minutes. Be sure to watch them carefully, to ensure they don’t burn.